Windows Update Service Not Running! Home › Forums › AskWoody support › Windows › Windows 7 › Windows Update Service Not Running! This topic contains 84 replies, has 20 voices, and was last updated by anonymous 1 year, 4 months ago. I get this on both pc’s and I have restarted both and get the same thing. I have gone into the task manager to try to turn on the Windows Update service but nothing shows for WU. I ran a Malwarebytes scan and no threats are detected. I am NOT sure what to do……..HELP!!! Is it SAFE to use our pc’s? Did you realize that we’ve passed “ExpiryDate”? I didn’t so I had problems with Windows/Microsoft Update. … or revert system’s date to older than 2017-12-03. I know this will sound complicated, but it really is not……. Tip: Instead of typing each line, you can select the text in the line above by high-lighting it, right-click, choose Copy from the pop-up menu. In the black window, Right-click anywhere, choose Paste from the pop-up menu, Enter. Canadian Tech I know you are trying to help but I really don’t feel comfortable doing anything like that on our pc’s. I am so scared of screwing things up worse then they are now and then I will really be in a mess. What I don’t understand is WHY did BOTH pc’s do the exact same thing on the same day. One being left in sleep mode and one shutdown, neither installing any sort of update? I can confirm the reset described by Canadian Tech here worked in at least one instance. Caution, it is destructive to Update History; but everything will still be properly listed in Installed Updates. My 2011 Toshiba Satellite laptop (AMD) is now a secondary device, so I was less concerned with it’s fate. I remember when CT started his epic Answer thread on that volunteer website, and what caused it. I am not a big believer in coincidences. Aging Win7 is still outdistancing Win10. And there is a major gift-giving holiday this month. Might be a good time to nudge a few people into the market place. By hook or by crook. I also acknowledge that if a transient problem at Microsoft’s update server just happened to become repaired within the same hour that I applied CT’s method; then I have come to a wrong conclusion. See above opinion regarding coincidences. Pardon me, I used the term destructive without mentioning that all can be restored until you take the actually destructive action of deleting the renamed folder. The only thing CT’s reset does is hide the previous folder under a new name. To recover, without destroying either, shuffle the folders by renaming the new to a third name, then rename the old to the original. Reread that until it makes sense. Thanks, that worked for my Win7 Pro 64-bit w/ last visit to WU 01 December. I think there is something else going on. @karens has two unrelated computers with the problem all of a sudden. A friend of mine has the same problem when I tried to help her with updates this afternoon. 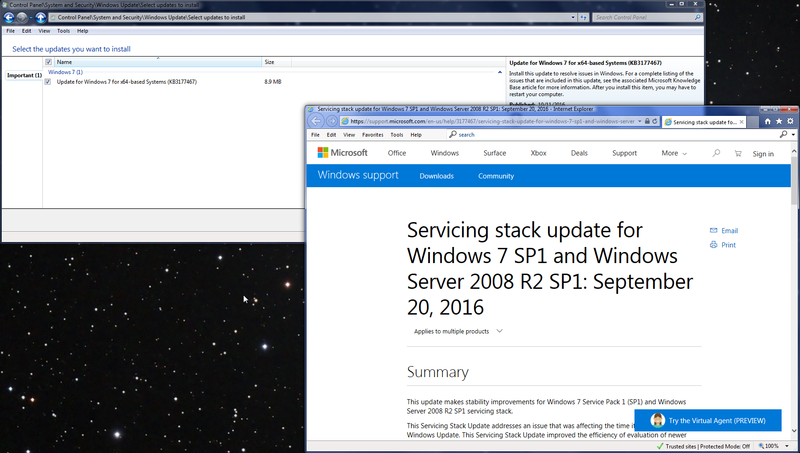 I had two pending updates on my Win7 – unchecked MSRT and a checked Office update that I have been waiting on. It now says I’m up to date – no updates. One of the few hardware installs I have – is having the same problem – it’s been down since the last updates. I think there is a problem with MS. I am also receiving the same Windows Update Error when I just checked for updates. The error code is: 80248015. 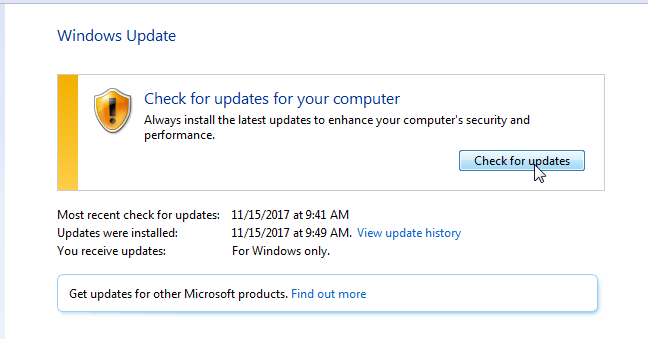 Prior to checking for updates I noticed that the unchecked November MSRT windows update had been removed, and that the most recent MSE definition update failed to install. The last one to correctly install was 1.257.1318.0 at 7:30 am this morning. A few months ago there was a similar problem that turned out to be caused by a faulty MSE update. At that time it took 3 or 4 days before Microsoft corrected the error. CanadianTech and PKCano I am having the exact same problem! PKCano do you think it is a problem with MS and we should just sit tight or is the Nov. rollup the problem???? I don’t think this has anything to do with MSE – non of those reporting have done the updates. I think MS is having a problem. Maybe WU is down. It’s too widespread for it to be an individual’s PC. What I noticed yesterday or the day before, was that one of the MSE def updates was in the recommended/ optional section of WU, these def updates are normally in the Important section. It is truly a shame what a mess Microsoft has made of the decades long revered Windows Update (WU) system. I know I am a heretic, but I saw this developing over a year ago. I look after about 150 client Windows 7 computers. September 2016, I set all computers WU to Never. For some months until May of this year, I applied so-called “security only” updates. Then they became all messed up. Office updates have become a cesspool. At that point, I decided that the risk of Microsoft making a positive mess out of our Windows 7 computers was a certainty, while the risk of some hacker with a virus making a mess of our home computers was far less. Not a one of these computers has seen a Windows Update since May 2017. They are protected by Bitdefender antivirus. Not a single one of them has had a problem of any kind. They are all stable and run completely reliably. Bottom line, for us, January 2020 has already come and gone. Guess what, Windows 7 looks better than ever for now. PKCano that was my first thought when I realized that both of our pc’s did the exact same thing. I tried to Google it to see if there was a issue with MS or Windows Update but I can’t seem to find anything. That was another one of the reasons why I didn’t want to mess around with changing anything because if it is on MS’s end I might just end up doing something that I shouldn’t. I am a little relieved to hear that I don’t seem to be the only one having similar issue, not that I wish this on anyone else. Both my husband and I have Toshiba pc’s but different model numbers, both purchased in 2011. We had 4 Outlook 2010 updates (checked) and then the .NET update, the monthly rollup (both checked) and then the MRST (unchecked). All where there at 1:09pm this afternoon when my WU checked for updates but then when I went to install them I got the message that there was “No updates for my computer that everything was UP TO DATE”. The next Patch Tues is the 12th. We have time to wait on this one. Take a deep breath and check back tomorrow. So is it safe to use our pc’s as normal in the meantime? You should not have a problem using the PCs. Just don’t run Windows Update until we figure what’s going on. Rodger that…..hopefully we find out soon and it is an easy fix either on their end or ours. Thanks again PKCano! My windows update stopped working today also here in Riverside, Ca. My sister in Fresno, Ca had the same thing happen today.We both have windows 7 – 64 bit Performed the windows diagnostic and did not help, Followed Canadian tech suggestion and no luck.???? Why am I not suprised with all this happening with Microsoft. Keep us informed, many of us depend on your knowledge to keep us going. Thanks for all you do for us. So I guess I’ll just sit tight for now. I was almost tempted uninstall the Nov. rollup (my first attempt at Group A). I’m getting the same message as Karen. dgreen and others. If you would be interested, I can give you the process I use for re-building PCs within my strategy. Did not use yesterday but it was working Friday night. sfc /scannow says it saw and fixed a dll. I ran this windows-WindowsUpdateDiagnostic.diagcab to see what the MS fix would do, but it undid fix sfc fixed, so avoid that one. I guess they finally lost their minds and move towards win 10 or else. The only update on my PC in last 48 hours (it was up) was the MS Security Essentials, nothing else. No updates for me all of November last was Oct 27. I just did a search for updates and have encountered the same error as twbartender: Code 80248015. Windows update was working fine for me yesterday (3/12). On 1/12 I installed the Office updates, Security Updates KB4048960 / KB4047206. The strange thing that happened to me though is that MSRT for October was offered again (checked), which I ran, but I didn’t realise until after it was for the previous month. Everything worked as per normal so I didn’t worry about it (it’s not as if this hasn’t happened in the past!). I think those threads will grow once everyone around the world accesses WU. As PKCano mentioned, it may seem as if this is an MS problem. I just noticed the same problem with Windows Update on my WIN 7 Pro sp1 x64 machines. Don’t know if this is relevant but one hour ago Microsoft Security Essentials automatically updated the definitions to 1.257.1328.0, although it didn’t show up in the update history of Windows Update as it normally would. My best guess is that the Windows Update failures are related to Microsoft Office 2007 no longer supported. I had expected Windows Update to continue to function but simply not return any MS Office 2007 updates. Instead it appears that Microsoft got heavy-handed (on purpose or accidentally) and makes it appear that your Windows Update is corrupt. Why do I think this? Because I restored to a month old disk image when Windows Update had been working fine, but even after going back in time, Windows Update failed the same way. I downloaded MicrosoftFixit50202.msi and had to run it in “aggressive” mode to reinstall Windows Update. 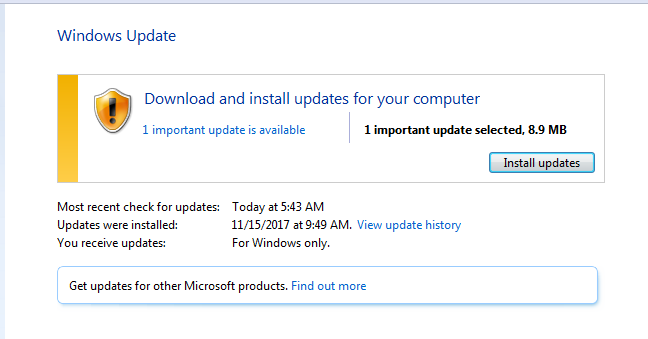 That allowed me to run Windows Update to get the November updates, but I can’t turn on the “Get updates for other Microsoft products” (which had been for Microsoft Office 2007). Unclear whether Microsoft has done this deliberately or by accident. Not sure if your theory is true or not but that wouldn’t explain why WU stopped working for me or my husband because we both have Microsoft Office 2010. I too am unable to get updates – I have win 7 64x pro. I am not tech savvy and would rather not do complicated fixing & digging into the innards of my computer unless absolutely necessary. My question is: Do you think MS will fix this in several days or will we be on our own because win 7 is just about on its way out for MS support? Many others are having this issue. This is what i can see. The authcab file(s) (eg %windir%/SoftwareDistribution/AuthCabs/authcab.cab) contain an XML file called ‘authorization’. There seems to be one for windows update and one for Microsoft update if you have that installed. which depending on your timezone is more or less now. where that guid relates to MS Update. Hopefully this means we simply have to wait for MS to update the, er, updater so it will have a new expiry date! I believe in a perfect world the updater will do this automatically once one becomes available. Otherwise hopefully we are supplied with a download link somewhere. BTW I also changed my update settings to “never check…” until this is resolved. which would check for updates once a day. Apparently some are having issues with updating MSE definitions also. Since then it stopped and initially presented a screenshot saying that there were no more updates available (green shield). Trying to run it manually, got error. The /WER/ReportQueue had reports mentioning an error that was equal to not being able to connect to the remote server. Now I get the same error as the OP . Those are now vanished, and the only reports showing are in /ReportArchive , fresh after today’s startup, with a 80244019. Woke up to the same on both pro versions of W7x64 and W7x86. Also MSE definitions update error on the W7x64, I then updated defs via mpam-fe on the system ok.BUT, WU was running and fully functional…go figure?! Stopped WU service via cmd, Cleared SoftwareDistribution, restarted and tried again with still the same results on both systems. Do any of the messages people are seeing here state WHICH service is not running? I ask because Windows Update requires several services to do its work. The information might be available in the event logs. FYI, I have several Win 7 systems that got their updates around the middle of November. One is a test VM that I can easily snapshot and revert as needed. I just reconfigured the firewall to allow updates (normally the system can’t reach the servers), started the Windows Update service on it (I normally keep it disabled), and saw this sequence. The only thing I didn’t have from the November update set, probably because of the timing of when I ran the update, was the the “Servicing Stack Update” (dated September 20, 2016!?!). Not sure if this helps identify what’s wrong, but it’s a data point. Any suggestions for the next thing(s) I can test here? Just saw a POSSIBLE temporary solution. Change your computer time/date to December 1. Recheck for updates. It showed this check went OK. Reset time/date to current time/date. Open Windows update. It shows most recent check as 12-1-2018 @ current time. Recheck for updates. Shows Error 80248015, BUT it also shows last check for updates as 12-1-2018. It looks like Windows Update on THEIR end is not working. I’ll check again later to see what is going on. Noel Carboni, anonymous #149436 here. If I recall you are among those who advised hide KB971033. I wonder if among or across your variety of Win7 systems you have a Home Premium equivalent with or without this item installed, and if that has any bearing on the current problem? This is an old item, last discussed this recent July. But in July Windows Update still worked, and we are now under new conditions. Can you eliminate this wrong tree for me, so that I might look for squirrels somewhere else? I’m sorry to say that I have no Win 7 systems on which I haven’t hidden that update, so I can’t contribute a data point to that thought. But apparently it’s been or being resolved by Microsoft now anyway, so perhaps it’s a moot point. Regarding Pepsiboy’s comment above about changing the clock: My advice: NEVER intentionally set your computer’s clock back or forward. Some products will invalidate your license if they detect you doing so, most likely because of the legacy of people who have tried to run free trials for longer than intended. Thanks Noel, for the follow up. If things had not been repaired, then your input would have been a valid data point. It successfully excluded that update from consideration. Because among the field of systems with that update hidden were both clear and afflicted systems. Today my machine is running cleaner than usual. Thanks again. It took M$ more than 1 week to fix this simple Nov 2014 problem for Win XP SP3 and Win Server 2003 regarding M$’s own set Expiry Date for the authorization of Windows Update. … In the first place, was there a need for such Expiry Dates.? Doesn’t M$ stop sending important updates when an OS reached EOL.? Seems, M$ are “forgetting” their older OS which still have to be supported and then took their own sweet time to fix the problem. Well, it states that the Windows Update service is not running, simply. The problem is not your PC. The problem is on Microsoft. I did realize after reading the post that was linked onto the ms website. I’ve provided to warn all the chatrooms I’m into, for all that it may be worth anyway. … In the first place, was there a need for such Expiry Dates.? Doesn’t M$ stop sending important updates when an OS reached EOL.? Seems, M$ are “forgetting” their older OS which still have to be supported and then took their own sweet time to fix the problem. After running into this on 2 machines this morning, I renamed the Software Distribution folder and restarted the update service and got it working. After the fact, I saw the older AskWoody posts about the problems that come with that solution regarding update history, etc. I have these machines set to check for updates, but not install them. Will the workaround I used have any effect on that setting going forward? Just want to know how to handle updates in the future. What you did for a “workaround” really wasn’t one. It was not necessary. The problem was on Microsoft’s end. They expired a file that should not have been expired. So you should not have to change anything you have been doing with updates in the past. Per Link above I JUST Fixed “Check for Updates” WU Error Code 80248015 by Stopping WuAuServ (Admin Cmd Prompt) and going to C:\Windows\SoftwareDistribution and Re-Naming it w/extension ( .Sdold ). Did a Re-Start. WHEN WU shtcut First Clk’d it presented SAME Error Screen – BUT – when Check for Updates was Clk’d the Process Started. A NEW SoftwareDistribution Folder results (the old, Re-named on is 1+ GB, so you can Delete WHEN Working WU confirmed). Hope this helps someone, albeit Error Code likely different. You LOSE Update History when you Rename SoftwareDistribution Folder. SAVE File IF you know HOW. EDIT 12/4 12:34 CDT: After W7-64 Rollup install and TWO MORE RE-Starts my System is back to Normal in spite of the following: I JUST RE-Installed W7-64 Rollup KB 4048957 after several posted – OK with theirs – and as Prior – Opening JPG, PDF, DOC, XLS Documents from desktop ShtCuts Takes FOREVER, as Does CLOSING them. Opening Folders with Files is slightly delayed and Closing is OK. Made Macrium Image just prior to Rollup Inst. Snipping Tool Save As is very SLOW. Thanks for all the information here regarding this problem. It works, but you lose your update history, although all updates still show up in Control Panel\Programs and features\Installed updates. Hello, Portugal user here and I just have this exact same problem, same screen and same message box when I press to check for updates, I normaly like to wait 2/3 days after woody gives the heads up to see if no other bugs pop up. My machine is running Win7 Pro. MSE is updating fine tough (guess is independent from WU). So what do you guy recommend? Should I manually install the roll up (Im on group A) or should I just wait it out? I would appreciate if anyone could there me where to get the monthly roll up file to install manually in case that is the recommend course of action. I’m having a hard time with this site!! It won’t let me log in. Hopefully this post will get through. I found a temporary fix for the windows update issue. I found it on the following site. you have to go to update settings and uncheck give me updates for Microsoft products. I did and my checking for updates worked without a problem and was able to install today’s MSE definitions. apparently the fix comes from someone in Germany. Aka, deselecting the option to search for other Microsoft products. Anonymous #149436 from above here, again. I have read about the Expiry issue, but do not understand how that means the Windows Update server/service/process/result continues to work for me and approximately half of Woody’s readers even today. And I have synchronized system clock to NIST.gov. I even verified that by manually changing time to a future hour in an elevated command line, then using the Timesetting GUI to check Internet Time, and it snapped back immediately. I would have skipped this topic, except I think we have a barking dog at the wrong tree. And Microsoft gives us many trees to bark about. I say this because while the Windows Update GUI itself is fully functional, now the MSE GUI returns a nearly identical code 80248014. That is near enough that I am willing to think it is related. Why one repaired but the other not? I intend to perform the same ‘reset’ as described by Canadian Tech a second time, to determine if MSE will properly check for updates. Incidentally, the magic is in the renaming of folders, thereby hiding them from the too smart for itself system. If you are doing this for a second (or more) time, you will need a new folder name each time. Duplicate folders can eventually be manually deleted, but it is a good idea to keep track of them until normalcy has returned. Anonymous #149436 from above here, again, replying to self to report result. Forcing the process to recreate these folders contents eliminates error 80248015.
expiry date is a problem, Microsoft is incompetent, but that doesn’t matter here. this error is not repaired using this method. New conjecture: because I have to rehide unwanted updates after having eliminated my prior list, the update number KB971033 is jumping out to me because it stands alone as important and checked, while four other unwanteds are on the optional/recommended list unmarked. New Question: Is there an opinion on this item, KB971033, as it pertains to this error 80248014? Usual thanks, and respect to all involved. Here’s a workaround that works for the windows update issue. I did it and it works!!! I did and my checking for updates 2 times worked without a problem and was able to install today’s MSE definitions. I strongly recommend setting WU to NEVER, leaving it at that setting permanently. It is the only sure way of gaining complete control over the WU process. The process (WU) has become unpredictable, unreliable, and just plain erroneous so much of the time, that Woody’s MS-Defcon rating is almost always at 2. I’m dgreen the one who posted the “workaround” above. This site wouldn’t let me log in. I used the above workaround and it worked perfectly. No issues whatsoever. I just did a 3rd windows check and it’s running fine. I’m not going to push my luck however. Others have mentioned that they might wait for the update server to reset. Or try this. Hello, still investigating but it appears this is only affecting stand alone systems. All of my systems on the domain reporting to WSUS are not getting this error. I’ve only been able to check a handful of systems but this is what I’m seeing so far. Wow, thanks so much for this information. I was wondering what went wrong yesterday when I could no longer connect to Windows Update on my Windows 7 Professional machine. Broken for me as well even though the service shows as running. Good job, microsoft! Your incompetence never fails to surprise. Not that i use update much as i’m in group b and regarding that… has anyone tried installing the security only updates? Any issues? I’ve still yet to install november and wondered if it was wise to do so at the moment, provided that is even still possible. I did install both november patches ( group B ) this morning, with the windows update issue already hitting me since last night. I got the 80248015 error early\mid-afternoon yesterday, Dec. 3. I had just checked for updates and was notified that 4 Windows updates, a .NET update, and a half dozen or so Office 2007 and 2010 updates were waiting. I got the error immediately when I tried to download and install these updates. When I couldn’t find any reports of others experiencing this problem with the November updates I assumed I was alone. I searched on the error and found and applied the solution to rename the SoftwareDistribution folder. That ‘fixed’ Windows Update but it wiped out my WU history, didn’t download any Office updates, and removed the WU settings check box to check for other Microsoft products. So I did another round of searching on this new problem but none of the solutions (generally altering settings in IE 11) worked for me. And that is where I am now. So I was happy to discover today that it wasn’t just my PC afterall. Now I am waiting to see if and when Microsoft will fix this problem (how can they roll out an update to fix WU if WU is broken?). And I’m hoping I can reverse the renaming of the SoftwareDistribution folder and the changes I made to IE11 and put things back the way they were. If not I’ll have to restore from my last image . . . If you search for the error on the Internet, you can quickly find indications that time, date or the time zone are incorrect (see e. g. here). But I was able to rule it out very quickly. Then I visited my blog post Tip: Windows Update error code 0x8024xxxx list to decode error 0x80248015. It stands for WU_E_DS_SERVICEEXPIRED – An operation did not complete because the registration of the service has expired. Well the screams from around the world got the job done and WU seems to be working again. I came to see what new posts were here on Woody’s and low and behold the Windows Update icon had returned to my task bar. When I click on it I get the normal looking box with all the updates waiting that were there before all this mess started. Thank you to everyone who posted with not only advice to help solve the situation but those who posted to say they too also had the problem so that myself and others knew that we weren’t alone. Ditto here. The windows update service is up and running again. It can be verified by going to C:\Windows\SoftwareDistribution\AuthCabs\authcab.cab file. The expiry date in the authorization.xml file now shows 2025-07-01T00:00:00.0000000-00:00. And a Windows Update ran normally. Before I read Woody’s article today I found this fix – https://answers.microsoft.com/en-us/windows/forum/all/cant-install-windows-updates-error-code-80248015/61f1309b-90f3-4c5f-bcc3-63440155577a?auth=1 It works, but you lose your update history, although all updates still show up in Control Panel\Programs and features\Installed updates. IF Renaming SoftwareDistribution was YOUR fix and Update History is lost as per here, my Installed Updates List has 11 Entries of the SAME UPDATE in the 7/15 Group, one more in August, and does NOT match Update History. IF you Re-Named the SftDist Folder.Sdold & haven’t DELETED it, Does ANYONE know IF you can go in there and Find the Old Update History File and Copy-Paste into the newly Created one? I tried this and it didn’t work – but that was before MS fixed things. Checked Updates and it indicated you should check reqularly for updates (red warning). The install updates button was missing. Now system notifier says to check for latest updates and on execute says WUPDATE service is not running. Rolled clock to Dec 1 . That does enable ability to download did that yesterday as well but put clock correct and ability removed. If I set the clock back give me updates and give detailed notifications reappears. When I correctly set clock they disappear. Change clock to before Dec 1 or 2 and it works even letting MSSE get latest definitions. I do have Visio 2007 but use office 2010. 2007 was EOL I believe, big deal Visio still works. I installed 2 updates for MSSE only on 2 separate win update launches. I then set the clock to correct day. The win update is now working for me. I did a restart of PC and it still works. I just did a shutdown and restart and it is still working. Again I only installed MSSE definitions today. I installed one last night along with Office updates but it was not fixed until doing what I mentioned above . Hope this helps somebody. And hope it continues to work for me. Wow, update issue in Windows 7 issue finally fixed for me. It took the steps listed by guenni as well as then running the Windows 7 Update Troubleshooter and then having the troubleshooter flag this issue and then using method 2 in the Microsoft article. Now, I can finally update Microsoft products again in Windows 7. I hope this may benefit other users as well. I got the 80248015 error early\mid-afternoon yesterday, Dec. 3. 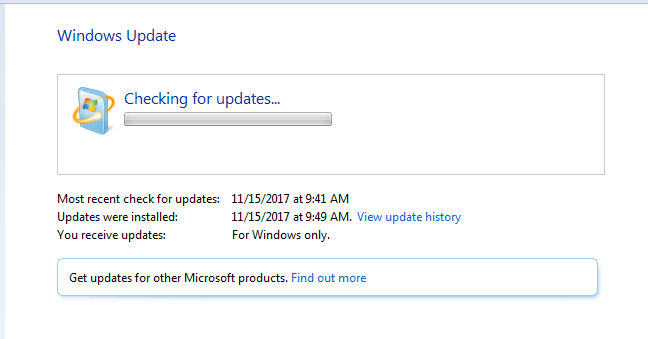 I had just checked for updates and was notified that 4 Windows updates, a .NET update, and a half dozen or so Office 2007 and 2010 updates were waiting. I got the error immediately when I tried to download and install these updates. When I couldn’t find any reports of others experiencing this problem with the November updates I assumed I was alone (silly me). I searched on the error, found and applied the solution to rename the SoftwareDistribution folder. That ‘fixed’ Windows Update but it wiped out my WU history, didn’t download any Office updates, and removed the WU settings check box to check for other Microsoft products. So I did another round of searching on this new problem but none of the solutions (generally altering settings in IE 11) worked for me. And that is where I am now. So I was happy to discover today that it wasn’t just my PC after all. Now I am waiting to see if and when Microsoft will fix this problem (how can they roll out an update to fix WU if WU is broken?). And I’m hoping I can reverse the renaming of the SoftwareDistribution folder and the changes I made to IE11 and put things back the way they were. If not I’ll have to restore from my last image . . . I can confirm that if to fix the 80248015 error you followed the procedure to rename the original SoftwareDistribution folder to Sdold (or something else), then let Windows create a new SoftwareDistribution folder, and you got back your functioning Windows Updates but lost your Windows Update history and your ability to get MS Office Updates, you can back out these changes (rename the new SoftwareDistribution folder to Sdnew or something else, rename the Sdold folder to SoftwareDistribution) and Windows Update will be back to normal as if none of this ever happened. Phew. I solved the problem today in following Woody’s advice and just set back the Windows 7 Systems Date to September 2017. After doing so I restarted my computer and then used the Windows Update program. As expected, I could successfully watch for updates. Then there was of course the famous error message, but it did not matter. Meanwhile my busy computer had automatically downloaded another MS software authorization cab file with another expiry date allocated someplace in 2025! Then I re-set the systems date to today (2017-12-14) and rebooted my computer. Looking again for windows updates the program told me that there were 5 important updates waiting to be downloaded. Meanwhile I did the updating and Windows Update works fine again, hopefully up until 2025? Reply To: Windows Update Service Not Running!